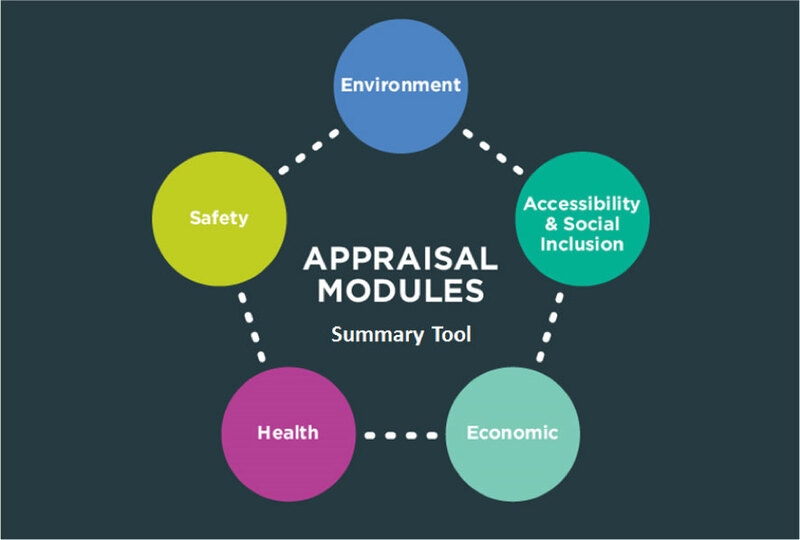 The appraisal modules provide a full suite of appraisal tools in line with national guidance. They interact with the Regional Modelling System to extract the necessary data required to appraise schemes, policies and strategies. Click on each module to find out more. 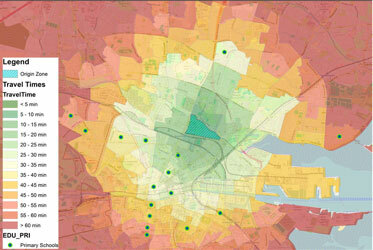 These results can then be mapped in GIS on a grid system as shown below. The Environmental Specification Report can be viewed by requesting the report from ntamodel@nationaltransport.ie. Figure: Change in CO2 Emissions (kg) in the ERM. 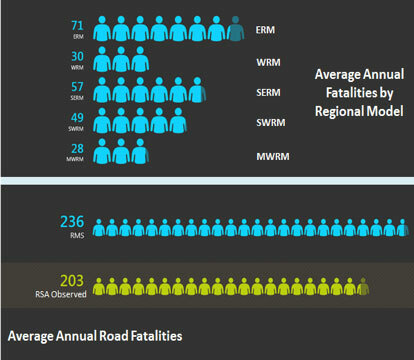 The Safety Tool conducts an analysis of the impact of road accidents for transport schemes. The process is based on TII’s updated COBALT software. Analysis is done on a link-by-link basis which allows key routes or corridors to be identified. The safety appraisal is based on a comparison of the number of accidents on the transport network by severity and associated costs between a ‘With-Scheme’ and ‘Without-Scheme’ forecast scenario. The inputs into the process are modelled road network characteristics such as link type, road length and speed limits, as well as accident rates and costs, and modelled forecast traffic volumes. The key outputs are the forecast number of Road Accidents and Casualties by severity type (i.e. Fatal, Serious or Slight.) 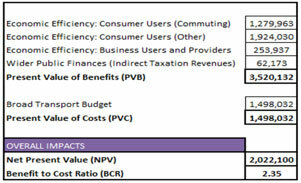 and the Economic Benefits covering a 30 year appraisal period. The Safety Specification Report can be viewed here. 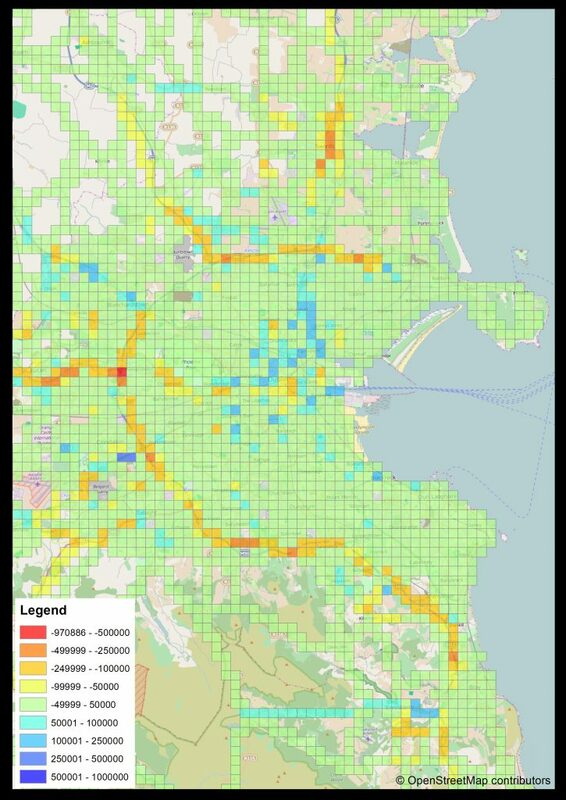 The scope of this Health Appraisal Tool is to provide the basis to calculate benefits associated with changes in levels of physical activity and absenteeism as a result of more walking and cycling taking place. The basis of the health module is the tool developed by the WHO, the Health and Economic Appraisal Tool (HEAT). It calculates the health benefits associated with changes in physical activity resulting from differences in walking and cycling. Benefits associated with a reduction in absenteeism primarily arise through increases in physical activity levels leading to increased productivity as a result of reduction in short-term sick leave. The health benefits associated with physical activity are derived from a reduction in the relative risk of premature death – the ‘Relative Risk of Mortality’ is directly linked to the time spent walking and cycling based on the average length, speed and frequency of new trips encouraged by active travel modes. This indicator provides a calculation of the lives saved due to the health benefits of cycling and walking. The health report can be viewed here. The Economic Appraisal tool uses TUBA software to perform a Cost Benefit Appraisal with DTTAS guidance and parameters. 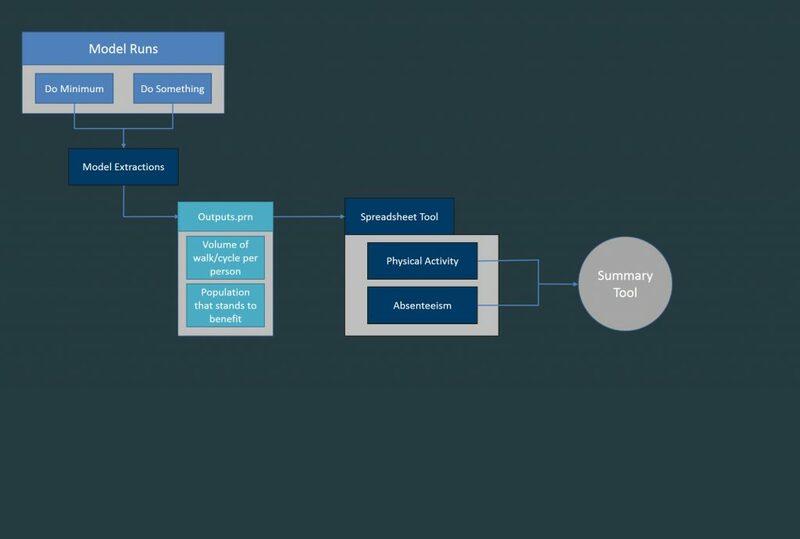 It comprises a system of processes that takes information from the regional models, runs the TUBA program, outputs standard results and allows filtering of results and output to shapefiles. The tool allows the user to specify scheme specific details and scheme costs and calls a file containing standard Irish economic parameters, in order to run the TUBA program. The Economic Specification Report can be accessed here. Monetised benefits of the scheme for a 30 year period. The Accessibility and Social Inclusion Appraisal Tool is a Cube Voyager (version 6.0.2), Excel spreadsheet and ArcGIS based application. Three measures are used to assess accessibility and social inclusion changes between a ‘With-Scheme’ and ‘Without-Scheme’ forecast scenario. These are: a Travel Time Measure and a Simple Hansen Measure for the Accessibility assessment, and an Income-based Geographic User Benefits Indicator for the Social Inclusion assessment. 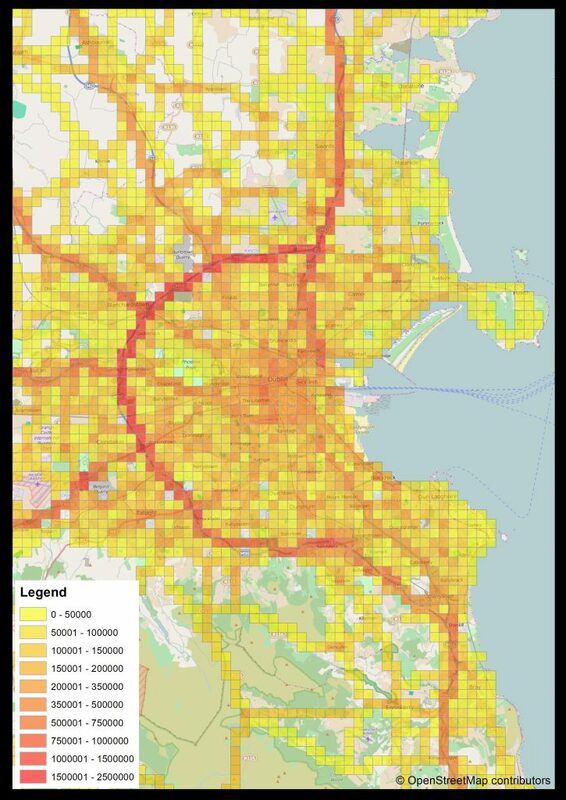 The Accessibility and Social Inclusion Appraisal Tool has two distinct elements: the Cube Voyager application element which processes transport model output and is used to inform the Accessibility and Social Inclusion measures; and the ArcGIS element which is used to display those measures via a graphical user interface. The Cube Voyager and ArcGIS elements are fully automated processes and run accordingly to a set of user-specified commands. The Accessibility Specification Report can be viewed by requesting the report from ntamodel@nationaltransport.ie.